The Trust has been established with a vision of creating an inspiring and sustainable Visitor Experience which will celebrate the town’s rich spa heritage, fascinating Crescent characters and the major restoration and renaissance of the Crescent. 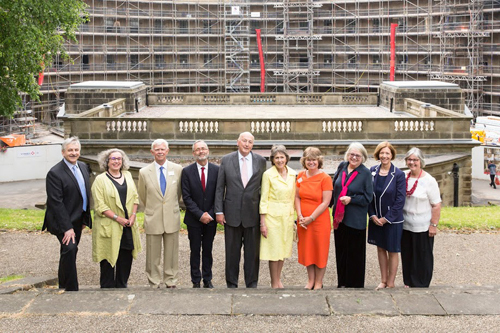 The important shared heritage and history of the Crescent and Chatsworth will also be explored with support from the Trust’s Patron, the Duke of Devonshire. A year round events programme for the Pump Room and 60 days of events and tours annually in the magnificent Assembly Room is also being developed. The Trust has started a fundraising campaign so we can deliver a high quality memorable Visitor experience and develop an effective family and education programme to engage the next generation. (b) Promoting the preservation and heritage of the physical and natural environment of the Buxton Crescent and Thermal Spa and its surroundings. The Buxton Crescent Heritage Trust is a company limited by guarantee, registered in England and Wales. Registered Charity in England and Wales number: 1178526. Registered Office: Buxton Town Hall, Buxton, Derbyshire, SK17 6EL. James was educated at Huddersfield University where he gained an Honours degree in Humanities, majoring in drama, and at the City of London University. He has an Honorary Doctorate in Business from Chester University and is an Honorary Doctor of The University of Derby. James’ early career started in arts administration and theatre management before moving to countryside recreation. He went on to become Nottinghamshire County Council’s first ever Tourism Officer and subsequently became Assistant Director of Leisure, responsible for the management of various tourist attractions including Sherwood Forest and Rufford Abbey. He was appointed to the Heart of England Tourist Board as Regional Director in the East Midlands before joining the Northwest Development Agency as Regional Business Manager for Tourism. He was subsequently appointed a Director of the Agency with oversight for Tourism and was instrumental in Liverpool’s successful Capital of Culture programme. In 2009 James became the Chief Executive of Visit England, the official tourism body for England. During his tenure he was responsible for formulating the first ever national tourism strategy for England and initiated a wide range of high profile public/private sector initiatives. Since moving on from VisitEngland, James has taken up a number of non-executive roles within the sector as well as advising on a variety of tourism related projects. He is Chairman of the Isles of Scilly Tourism Partnership, a Director of the Derbyshire leisure firm, Pinelog Ltd, a Trustee of SS Great Britain and is the Chairman of the Buxton Crescent and Thermal Spa Heritage Trust Ltd. James is married with one son. He lives in the Peak District where he likes to make the most of passion for the countryside as well as taking time to follow the exploits of his beloved Chesterfield Football Club, where he is a season ticket holder. Retired business development consultant. Specialist in management development and in stimulating business growth, both in the UK and overseas. A career starting in the Civil Service led to the appointment as Chief Executive of the agri-tourism marketing organisation, Farm Stay UK, and on to a range of innovative and interesting projects and appointments. Projects included ‘Developing Entrepreneurial Skills in Masurian Women’, defining a marketing strategy for Stanstead airport, developing farm diversification workshops for defra and project delivery for the national tourist boards including tourism business improvement; ensuring quality through developing bespoke training programmes. Current memberships and appointments include Buxton Town Team as a director, FRSA, Academy of Urbanism, University of Derby Court. Formerly a Secretary of State Appointee to Peak District National Park Authority, Director of Heart of England Tourist Board, Trustee of the Plunkett Foundation, membership of the Government Task Force to Examine the Impact of Tourism on the Environment (Countryside Committee), Chair ‘People in Tourism’ Project for East Midlands Development Agency, an initiator of Euro Gite, the European Federation of Farm & Village Tourism and UK Representative of Rural Tourism International. Tina served as a governor of Leek College for twenty-five years, latterly taking the position of Chair and leading on the merger with the University of Derby. Tina served on the University’s Governing Council and held the position of Chair of the Further Education Governance. I have lived in High Peak, Derbyshire, since 1983; in Buxton since 1994. Professionally qualified in healthcare management, I worked in NHS from 1969 to 1990, managing substantial budgets and large numbers of staff. Operated own nursing home business from 1990 to 2005 and worked as a free-lance management consultant during that time, being also Operations Director to a separate group of nursing homes. Having semi-retired at an early age I was elected a High Peak Borough member in 2007; immediately taking on a cabinet portfolio for Regeneration and Tourism until 2011. Contributed to the establishment of the Strategic Alliance with Staffordshire Moorlands. Conceived and delivered a multi-million pound programme to update the Grade II listed Pavilion Gardens and create the Pavilion Arts Centre, working with English Heritage (Historic England). Remained a HPBC member but in opposition from 20011-2015 and elected also to Derbyshire County Council in 2013. On regaining control of High Peak in 2015 I resumed my previous portfolio and became Deputy Leader. At County level I chair a scrutiny committee. As the lead portfolio holder I probably now have the best working knowledge of the Crescent project of any surviving elected member at either Council. I have been an active board member of Derbyshire Enterprise Agency, Derbyshire Economic Partnership and Visit Peak District and Derbyshire amongst others. I have a good understanding of public and private sector finance, of governance and of the standards of conduct required in public life. Dr Sarah Rawlinson is the Head of Department, University of Derby, Department of Hotel, Resort and Spa Management. She has led the development of spa management as a subject area in higher education in the UK. The University of Derby is the world leader in spa management degrees and provides graduates to some of the most prestigious spas in the world. She has worked in education for over 20 years, including teaching, management and research, and has published several journal articles and book chapters. She has been invited to speak at international conferences, and has undertaken research on the impact of spa graduates on spa businesses and the development of curriculum, work-based learning and the different use of knowledge in the workplace. Her most recent teaching and research focus has been on reconfiguring tourism destinations. Sarah is a trustee of the Arkwright Society, an educational charity devoted to the rescue of industrial heritage buildings and helping to preserve the precious built and natural landscape in and around Cromford. She is also a trustee at the School of Artisan Food, based on the Welbeck Estate in North Nottinghamshire, which exists to teach all aspects of artisan food production. The School is housed in the former fire stables, dating back to 1870. The newly refurbished training rooms are specially equipped for the teaching of breadmaking, cheesemaking, brewing, butchery, charcuterie and preserving. Sarah joined the University after a career in the travel industry where she worked in group travel organising conferences, incentive travel, trade fairs and exhibitions. Karen joined Derbyshire County Council in 1986 as a trainee solicitor and is currently Assistant Director of Legal Services. She has been the in-house legal adviser on the joint Council Buxton Crescent Project Team since 2005 and is committed to the restoration and regeneration of The Crescent and Thermal Spa as part of the nation’s heritage and to the work of the Trust in promoting the buildings and their history and ensuring they are enjoyed by local people and visitors from further afield. Karen is a member of the North Derbyshire Deanery Synod and of the PCC of St. Thomas, Brampton, on the outskirts of Chesterfield where she served as church warden for 8 years. She was part of the project team for the development of a new parish centre at St. Thomas opened by the former Archbishop of Canterbury, Dr Rowan Williams in 2011. John took a history degree at Oxford university. He worked as a social worker before joining Price Waterhouse and becoming a Chartered Accountant. He was the Finance Director for a number of NHS hospitals, and was responsible for the £1 billion redevelopment of the hospitals in Central Manchester.In recent years he has run his own consultancy business. From 2007 to 2013 he was Chair of Lifeline, a drugs rehabilitation charity, and from 2014 to 2016 Chair of Manchester’s Mental Health Care NHS Trust. He is a founder trustee of the charity Improving Chances for Uganda with his wife Patricia, a retired paediatrician. He has two grown up daughters and lives in Buxton. A senior professional with considerable experience in operating strategically and at corporate level to develop and deliver change management programmes. Skilled in balancing income generation alongside budget management. A leader and manager with exceptional interpersonal, ambassadorial and diplomacy skills focused on delivering successful partnership working to achieve business strategy. A decisive innovator enthusiastically committed to a high level of achievement both personally and organisationally. Experience in tourism, not for profit, higher education, communication agency, pharmaceutical and associated businesses. She has experience in tourism, not for profit, higher education, communication agency, pharmaceutical and associated businesses. Jennifer has over ten years’ experience in supporting charities, museums and art galleries as a Trustee/Director and has led and managed major gift fundraising programmes in higher education and not-for-profit sectors. Jennifer is currently a Director of Trent Bank Consultants, she was previously Chief Executive for Experience Nottinghamshire and Director of Corporate Affairs at Nottingham Trent University.